Sometimes pie makes me nervous and that’s a shame. My mom is a pie all-star. 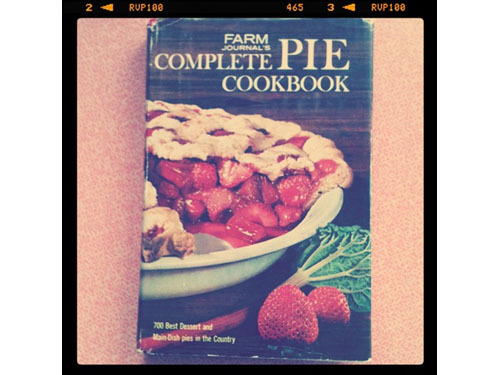 She made a strawberry rhubarb pie years ago and I just remember it being the best pie I’ve ever had. Before those bites, I doubted rhubarb! I was a fool. I love rhubarb now and just want to name my first daughter Rhubarbara. 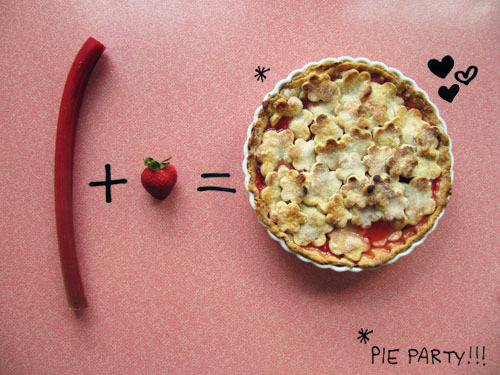 So, Happy Pie Party Day! I hope you all make pies and just embrace them for being juicy, summery, tasty, amazing, and fruity with burny-bits on top. Pies are your friend, don’t bother doubting that. And if you get nervous, just call my mom. That’s what I did. She told me that it’s ok for this pie to be juicy because the juice is the prettiest color you’ll ever even see. And she was right! Stir together the rhubarb and strawberries. Whisk together 1 1/4 cups sugar, salt and flour. 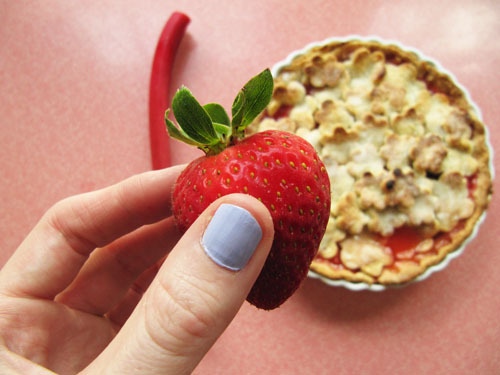 Arrange half of the strawberries and rhubarb in your pastry-lined 9″ pie plate. Sprinkle with half of the sugar mixture. Repeat with remaining fruit and sugar mixture. Dot with butter. Arrange top crust over the pie and flute edges. 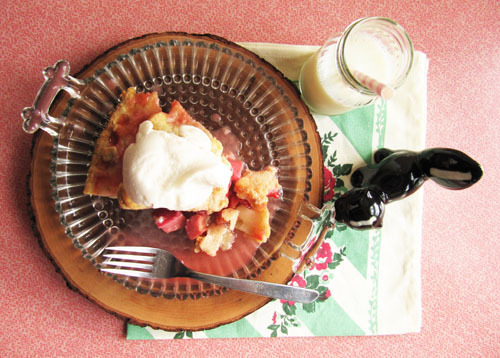 Brush the top off the pie with cold water and sprinkle on the remaining tablespoon of sugar. 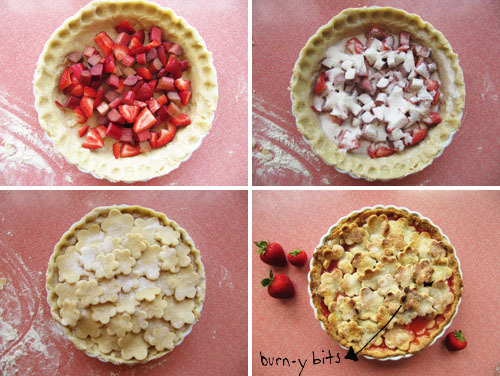 Bake in your hot oven for 40-50 minutes, or until rhubarb is tender and crust is browned. Rotate your pie halfway through bake time. If the tops starts to darken too quickly, tent it with foil and keep on baking. Jake said the crust was the best part. So there’s that. In a medium bowl, whisk the flour, sugar and salt together. 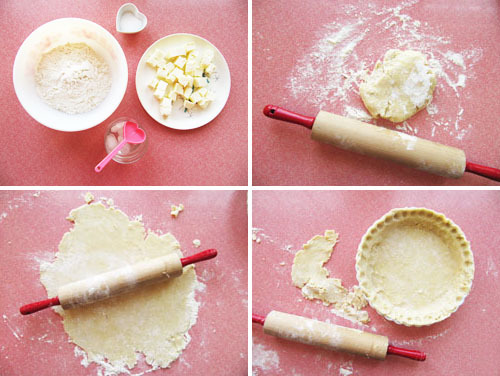 Cut the cold butter into the dry ingredients with a pastry blender or two forks until the butter is no bigger than peas. Drizzle the ice water one tablespoon at a time over the butter/flour mixture. Fold the water (about 4-5 tablespoons) in with a rubber spatula until the dough comes together. Knead lightly until all of the flour is incorporated. Divide into two balls of dough, flatten into disks, and wrap in plastic wrap. Chill for 2 hours. When ready to make the pie, roll it out! This ice cream is best the day it’s made; before it’s completely frozen. This ice cream tastes like a dream atop this pie. And it’s so quick! Place all of the ingredients in a blender. Bend for about 30 seconds, or until completely combined. Freeze in your ice cream maker according to the manufacturer’s directions. Transfer to a tightly sealed plastic container and freeze for a couple hours. Once really frozen, set on the counter for about 20 minutes to soften before scooping. My mom swears by this book! And she never swears. Something has changed in your photos, I think it may be the sweet pink tabletop. 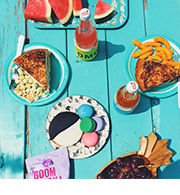 It is great, the pictures on this post just pop out of the screen, looks delicious! Absolutely gorgeous!!! 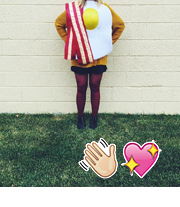 Love the photo styling and how you made cut-outs on top! So adorable! Rhubarbara….ahahaha. I’m afraid of rhubarb. Oh, and I love your nail polish. haha Thanks Rebecca! Rhubarb can be scary alone, but so lovely with strawberries. mark darcy! i love bridget jones, i really do. rhubarbara is going to be one lucky kid if she has a pie makin’ mom and grandmother too! i love rhubarb and those sweet little cut outs! sweet pie skillz girl. And, Yes! I’m so glad you understood my Bridget Jones comment. thanks for stopping my blog so i could visit yours. this is a great post. p.s. rhubarb always makes me nervous. And I hear ya about rhubarb. I was always nervous that it was just pink celery! I’m totally down with it when it’s hanging out with strawberries though. Lovely pie my dear!! It is one of the prettiest in the whole pie family!!! Poor misunderstood rhubarb…it just needed a friend to make it a happy thing!! Thanks, Mum! Rhubarb sure is lovely! I know it thanks to you! Oh my goodness, the little cutouts are so precious! They look so adorable and I bet they taste great! And this entire post is just so darn funny, but I especially liked, “My mom swears by this book! And she never swears.” Ha! You know, I haven’t cooked with rhubarb since I was a kid, with my grandmother! 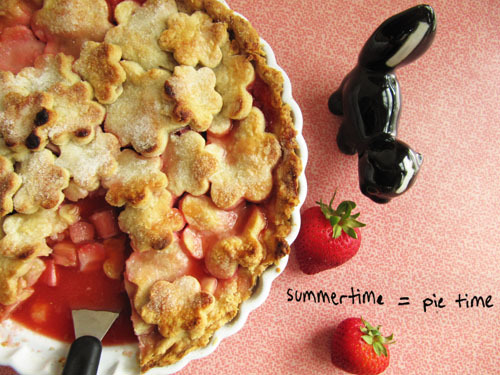 I think I need to get on this rhubarb goodness…the pie is adorable – huge fan of the cut out crust. LOVE. PS- we are currently sporting the same color nail polish. Tight work! And I love that we have the same nail color. We know what’s up! this is so great. I’m really liking your blog. I love all these whimsical photographs.